Sunny days with less rainfall have helped clear up some of the bacteria problems in the water at state park beaches. Mary Skopec oversees the water testing program for the Iowa Department of Natural Resources. She says you should be careful about swimming if there is rain in the area of your beach. “My advice is if we have a big rain — and again it depends on the timing — so, if we had a big rain for example on Friday, I would maybe give it a day or two to let the bacteria levels subside,” Skopec says. You should pay close attention to your kids if they are near the water.”Make sure you wash their hands frequently, so they are not putting their hands in their mouth and getting the water in that way,” Skopec says. Skopec says if you see green scum on the water, avoid the algae. She says pets are also vulnerable to the blue-green algae and should be kept out of the algae scums. 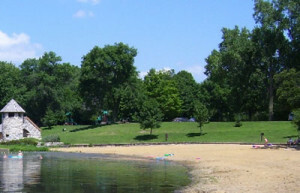 Beaches with high levels of bacteria this week are: Backbone Lake, Denison Beach on Black Hawk Lake, Lake Geode and Lake Macbride. For more information and the results of the beach monitoring, go to: www.iowadnr.gov.